He’s right to shift the onus onto curators rather than blaming artists for the market-driven phenomenon that has come to be known as zombie formalism. Yau concludes that visiting artists’ studios is the only way to see the best paintings, most of which are not being shown in museum surveys because they don’t suit collectors’ (i.e. trustees’) tastes. Museum curators may be in thrall to Zombist collectors, but plenty of galleries mount shows that are more compelling than the overly-produced, hotly-traded, undead variety. Here are a few paintings that stand out this week. Gary Petersen, Far Away, 2014; acrylic on canvas, 20 x 16 inches. “Gary Petersen: Not now, but maybe later“ is on view at Theodore:Art through February 22. 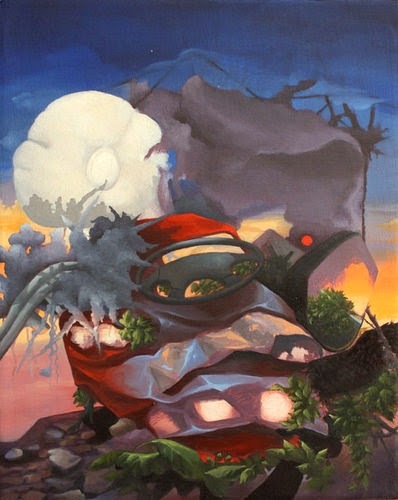 Petersen’s new paintings, still as elegantly fluid as previous work, rely less on skewed perspective and diagonal line and more on overlapping shape and color to add visual complexity and a promising narrative component. 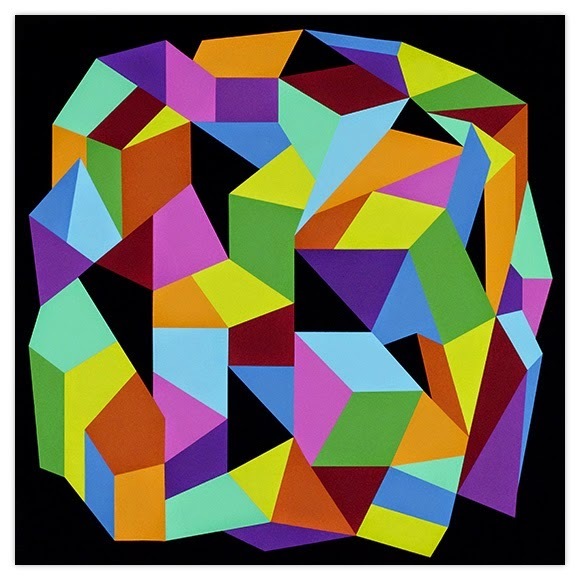 Julie Karabenick, #13, 2013, 2013, acrylic on panel. 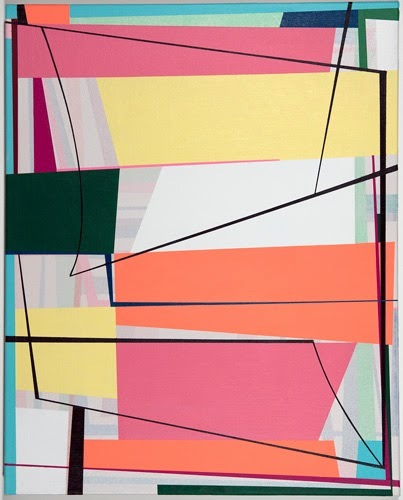 Karabenick’s vivid geometric paintings are included in “A Few Conversations About Color,” a group show at DM Contemporary curated by the indefatigable Joanne Mattera, on view through February 28. 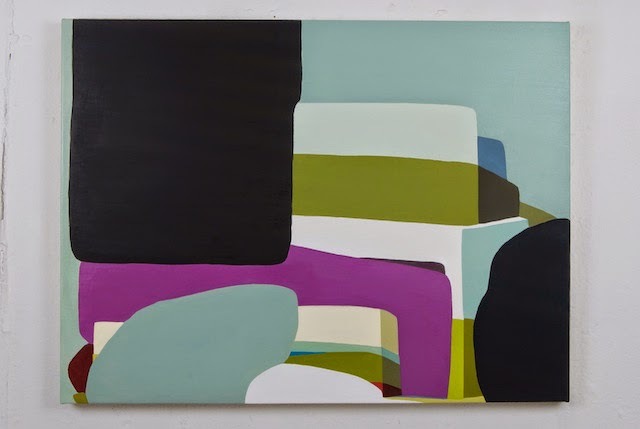 Based in Michigan, Karabenick curates Geoform, a comprehensive online database for contemporary geometric abstraction. A catalog for the show is available here. It’s nice to see Karabenick’s work in New York! DeKooning and Italian Baroque painters like Caravaggio and Pontormo. Also on view are a series of life-sized, hand-pinched ceramic portrait busts by Elise Siegel. Standing in the gallery, I felt as though I was surrounded by a group of eccentric friends–well intentioned and lovably daft. Brant Moorefield, Canopy, 2014, oil and acrylic on paper board over canvas, 30 x 24 inches. This little stunner is on view in “Fractured Atlas,” a three-person show of small-scale paintings in Storefront Ten Eyck’s Project Room. Moorefield’s use of saturated color, traditional technique, and an odd combination of objects and landscape imagery called out to me. 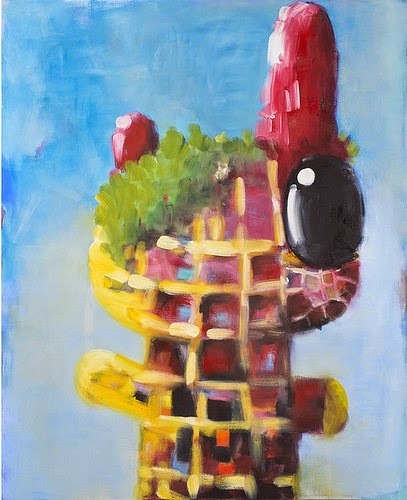 Also on view are paintings by Anna Ortiz and Gretchen Scherer. For more gallery listings, check out Andrew Ginzel’s List, with images selected by Two Coats of Paint.